This Christmas represents Dr Carl Muller’s last as a staff member at Prahran. Whilst he will continue to offer acupuncture for pets on a consultancy basis, we thought it a good time to revisit the history of Carl’s time at Prahran Vet Hospital, the practice he founded 40 years ago. Dr Carl Muller graduated from Melbourne University in 1968. He was part of the second graduating class of Melbourne University Veterinary school. On graduation he first worked in mixed practice in Bendigo and after six months moved to Benalla for 2 years in mixed practice mainly cattle and horses. He subsequently worked at Lort Smith Hospital. In late 1971 he went overseas and performed locums in various practices in southern parts of England. Arriving back in Melbourne in 1973 moved into 646 Malvern road and commenced practice in early 1975. The building at 646 was a far cry from the purpose built hospital we enjoy today. It was built in the late 1800’s. During the second world war it was divided into seven flats and later was a boarding house for single men for many years. Unsubstantiated oral history suggests that there were two large willow trees in the front yard and the building was a house of ill repute called “The Willows” between the war years. It took two long years to obtain council permits and renovate. 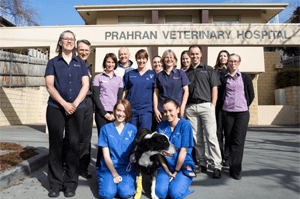 In 1975 Prahran Veterinary Hospital opened for business. For the first five years Carl lived and worked at 646 Malvern Road. In those days he was vet on duty 24 hours a day and 7 days a week. Tricia Chips was his first veterinary nurse. An English trained nurse her nicknamed was “Fish n”. She returned to the UK after a couple of years and by then a full time nurse could be employed. Carl worked hard but always enjoyed his leisure time. A keen tennis player he developed tennis elbow in the early 80’s. After conventional treatments did not help he tried acupuncture, and was impressed by the relief it gave him. Carl then went on to study human acupuncture, completing a course part time over 4 years. Carl was one of the first veterinarians in Victoria to use acupuncture to treat conditions in dogs and cats and has been instrumental in the development of acupuncture as a well recognised treatment modality in veterinary medicine in Australia. Since handing the reins over to Drs Peter Juliff and Nicole Hoskin in 2005, Carl continued to work on as an employed member of the team. 2015 marks a 40 year association with the practice and of service to the pets of Prahran, well done Carl. Second opinion from Dr. Muller gave Toby, our Greyhound, several years of happiness without antibiotics. Always grateful.